The brain is composed of billions of nerve cells, all interconnected . Signals pass from one neuron to the other not by contact but over tiny gaps called synapses. 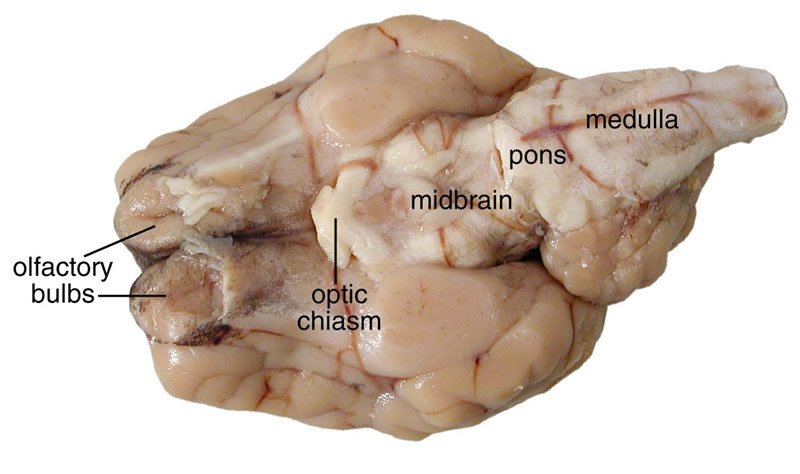 The brain is divided into many regions, all with highly specific functions and connected together for greater communication. Different types of neurons exist. Refer to the rubric before starting. 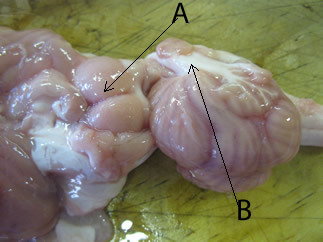 Draw a diagram of the exterior of the sheep's brain, as shown on the left. You will notice that surface of the cerebrum is organised into folds called gyri, separated by grooves called sulci. Click to see a diagram that might help. The cerebrum is deeply wrinkled and folded? Explain why. What could be some of the effects of the folding? Think of communication between different areas of the brain. Cut a small cross-section of one of the cerebral hemispheres. You will notice a band of darker coloured tissue called grey matter. In this area exists neurons that do not have long axons. The nerve cells of the grey matter form connections with each other creating networks through which nerve signals travel. This is where cognitive processing occurs. The dark coloured top layer appears darker because of the cells' dark nuclei. This is called the cortex and contains roughly 70% of the one hundred billion or so nerve cells in the brain. The inner, lighter layer is called white matter. This tissue is composed of the long extensions that transmit a signal called the axons. The white matter, is composed of neurons that have long myelinated axons, as shown above. It forms the structures at the center of the brain, like the thalamus and the hypothalamus. It is found between the brainstem and the cerebellum. It is this white matter that allows communication to and from grey matter areas, and between grey matter and the other parts of the body, such as muscles and major organs. Axons are protected by the myelin sheath, which provides insulation from the electrical processes, allowing them to transmit nerve signals faster than unmeylinated axons. It is also the myelin that is responsible for the white appearance of the white matter. 60 percent of the brain is comprised of white matter. However 94% of the oxygen consumbed by the brain is used by the grey matter. Why is the spinal cord composed of white matter? If myelin allows for faster conduction of signals why do the neurons of grey matter not have myelinated axons? Describe the distribution of white and grey matter. Give a reason for this. Indicate the location of the hypothalamus on your diagram. What is the purpose of the hypothalamus? The image on the left is pointing out the pituitary gland. What is being pointed to in the diagram on the left? What is the function of such fluid filled chambers in the brain? 1) What is the cerebral cortex? 3) What does the forebrain, midbrain and hindbrain consist of? View of the brain from beneath. 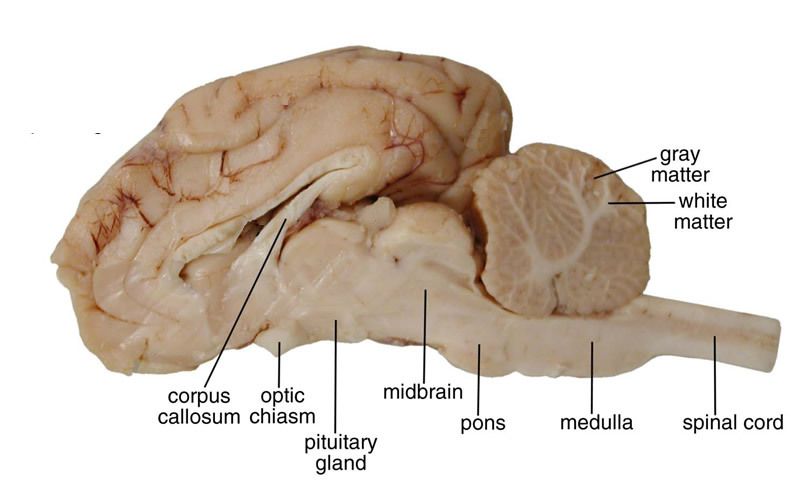 The brain stem is made up of the pons, medulla and cerebellum. Identify the parts of the brainstem in your drawing or digital image. 5) i) Identify structure A superior colliculus optic nerve pons frontal lobe . What is its function? 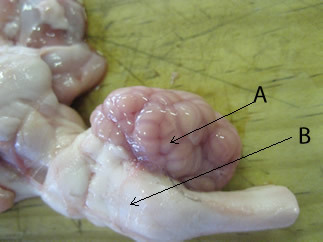 iii) When dissected, the white matter feels greasy and fatty. What possible explanation can you provide?